Picasso created this painting during the most critical period of his life, when he suffering of continuous depression from the death of his friend Carlos Casagemas. The paintings considered as a blue period masterpiece. Les Noces de Pierrette (translated as 'The Marriage of Pierrete') was painted in 1905, a time when Picasso faced poverty early in his career. 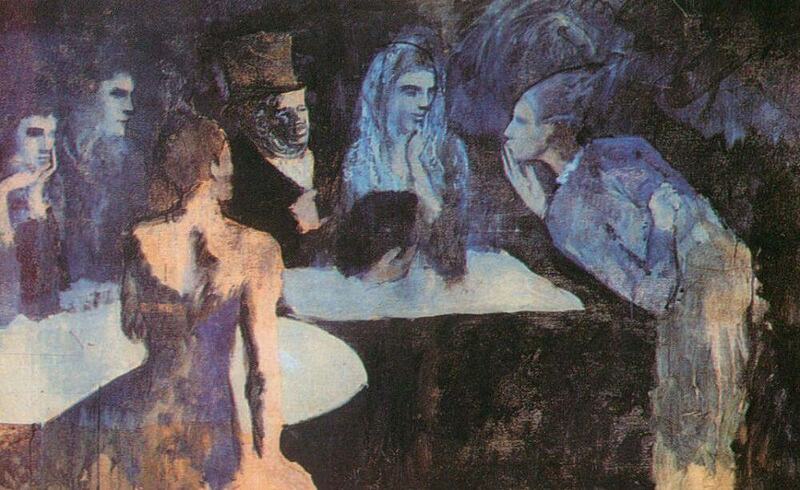 In this painting, Picasso uses many shades of blue. The blues help express the somber mood of the painting. Picasso portrays rich socialites gossiping and suited up in gowns and top hats yet no person seems to express any real emotions. This being done in one of the most down and out points of his life, Picasso was probably implying that, that was not a happy life either. Picasso's Blue Period is characterized by an extreme melancholy, and this is the feature that struck contemporary critics the most: "It is an extraordinary thing, the sterile sadness that pervades the work of this very young man. ... This frighteningly precocious child may well be destined to consecrate with his masterpieces the negative sense of life, that curse from which he suffers more than all others." The painting is believed to be the last of Picasso's Japanese themed paintings. In 1989, Les Noces de Pierrette was sold for US$49.3 million, and it is one of the most expensive paintings ever sold in the world.